Puffing Billy is a genuine relic of our more leisurely days. An historic steam train still running regularly in the mountain district it was built to serve at the turn of the century. The Railway is the sole survivor of four experimental lines used to develop rural areas in the early 1900’s. Puffing Billy is now a major tourist attraction, its operation depending on hundreds of dedicated volunteers. Puffing Billy runs every day of the year, except Christmas day, so why not take yourself and your family or friends on a sentimental journey along this 24.5 km operating museum. Enjoy the mountain scenery and panoramic views which pass by your carriage window. At Lakeside, the intermediate terminus of the railway is inside the beautiful Emerald Lake Park. You may stop over for a few pleasant hours bushwalking, swimming or just relaxing in the peaceful country setting. The terminus of the line at Gembrook is a delightful country town with much to offer the visitor. I’ve forgotten about Puffing Billy for a while until an officemate told me about their family trip to the Dandenongs last week. He also mentioned Puffing Billy in passing as it was in the general area. He told me that he had gone there a few times before. Since I was curious about the place/ride to begin with, I asked him about his experience. That got me more interested to go. 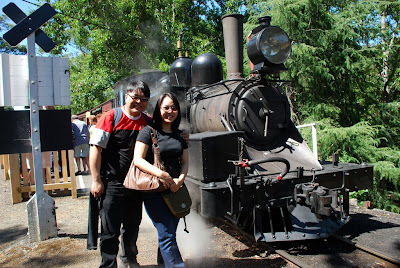 So, on my birthday, Raquel and I drove to Belgrave to get on the Puffing Billy steam train. It was great. I wanted to see an actual fully-operational steam engine locomotive up close. What I didn’t realise about these old trains was the amount of polution it generates though. I certainly didn’t expect the large specs of coal falling on our skin and into our hair. Some even fell on my lips and teeth! Still, I sort of loved it as I felt like I was transported back to the old West. It felt like I was riding a rural steam train into the wildernes back in the late 1800’s. We were lucky that we have a buy-one-take-one ticket voucher and the ticket prices were cheap that day. So we paid like a quarter of what we would’ve actually paid if we had paid full price without the voucher. I thought it was well worth the drive to Belgrave and the money we spent on the train ride. We stopped at the half-way point though which was about an hour from Belgrave. We felt that it wasn’t worth going all the way to Gembrook. I was just really after the train ride. We can always just drive to Gembrook in the future if we want and it will probably be faster than taking the train. After all, it was an old train and it didn’t really go that fast. So, if you havan’t had the chance to ride the Puffing Billy train, I recommend that you give it a go. I think kids will specially love it. Hey, can give some information on the tax rate? Is it really true that after paying tax, you are only left with around 50% of disposable income?